In support of our commitment to building long-term, rewarding relationships with our corporate and institutional clients, we've developed a straightforward and effective approach that underpins all of our relationships. 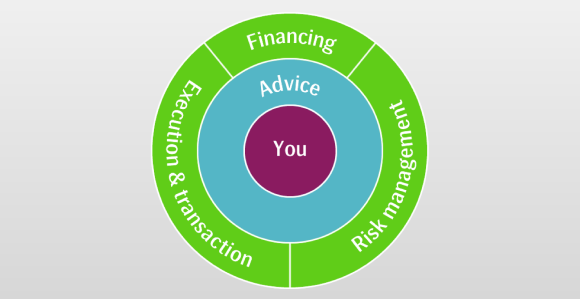 We call it the SEB Advisory Model and places advice at the centre of everything we do. Through our dynamic and focused client teams, we add value to your business by developing in-depth knowledge and insight into your needs. As our client, you have access to a formidable team of professionals with extensive experience in financing, risk management, execution & transaction and more. We have a proven track record and a wide range of expertise developed by working with most of the leading companies in northern Europe over the past 150 years. This is a level of knowledge and experience that no other Nordic bank can match. We believe this means that we are well placed to work alongside you in achieving your goals – whatever they may be. So whether your challenges revolve around your working capital efficiency, capital structure or asset and liability management, SEB aims to be your partner of choice.